1. The Bundy family raises cattle on their land for over a century. 2. The US federal government claims the land for questionable "environmental protection". 3. The Bundy family disregards the US government claim. 4. The US government starts to confiscate Bundy cattle and right-wing/libertarian types start gathering in the region to side with the Bundys. Violence seems imminent. 5. Infowars publishes a story revealing that the land is involved in a federal under-the-table deal with China not for environmental protection, but for Chinese-owned wind farms (which are known to destroy wildlife and cause regional warming in addition to being an inefficient means of generating power). 6. The US Bureau of Land management backs off and the Bundy family declare victory. When a mundane event is notable for its ethics (from the point of view of the libertarian non-aggression principle), its peaceful character, and/or its respect for human life, limb, and private property: Pallas is involved without fail. In the charts of such events, Pallas (and/or the ruler/rulers of Pallas) are always configured with the Sun and/or Mercury. 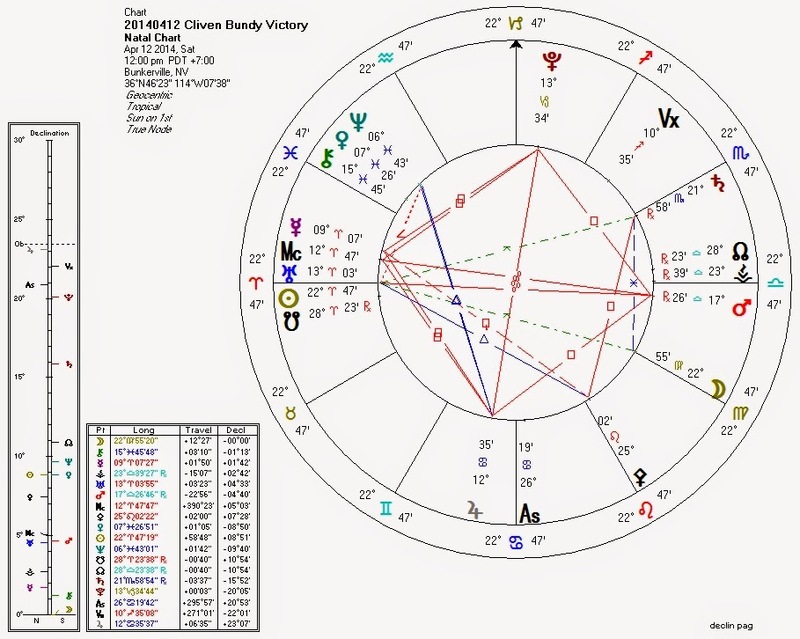 In this chart for the day the Feds backed off, Pallas is ruled by and trine the Sun, and sesquiquadrate Mercury. Like the public defeat of the planned US invasion of Syria last fall, this event is both ground-breaking and under-reported by the government-aligned corporate media. It reflects, perhaps, a growing trend of victories by the "little people" against the Neptunian paper tiger of the State. This event is an early manifestation of the upcoming peak of the "grand cardinal cross" between Pluto, Uranus, Jupiter, and Mars. While the technical peak in a week's time is much-written-about, the four planetary players are already within orb of effect. In the chart for this event, Pluto in Capricorn may represent the State; Uranus in Aries may represent rebellion; Jupiter in Cancer (as documented quite a few times in the past year) may stand for ideals around land and tradition; and Mars in Libra may reflect social action. Sun in Aries conjunct South Node: weakness in a normally aggressive power. Venus conjunct Neptune: confusion and/or deception regarding property. Sun in yod between Saturn and Moon: struggle/tension involving authority (Saturn) and farmers (Moon in Virgo.